iPhoto is the Mac default photo manipulation application. In Mavericks, iPhoto is available from the Mac App Store. It allows you to import pictures from digital cameras, scanners, picture CDs and the Internet to the iPhoto Library. Then you can organize, edit, print, transfer and share the imported photos with ease. It also lets you make dynamic slideshows of photos and music for exporting to QuickTime movie files and further editing in iMovie. If you are lucky to have iDVD on your Mac, you can even burn the slideshows to DVD discs with it. However, the iDVD was no longer pre-installed on Macs shipping with OS X 10.7 Lion. 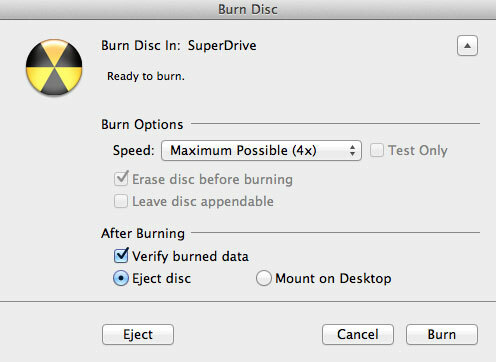 That's to say, if you'd like to burn your iPhoto slideshow to DVD on OS X 10.7 Lion, 10.8 Mountain Lion and 10.9 Mavericks, you have to turn to a third-party DVD burning application. The DVD Photo Slideshow is such a great tool for burning iPhoto slideshow to DVD. It is fully compatible with Mac OS X 10.7, 10.8 and 10.9. It lets you import slideshow video files generated with iPhoto into the project and burn iPhoto slideshow to DVD with ease. Follow the steps below to start to burn iPhoto slideshow to DVD with DVD Photo Slideshow. 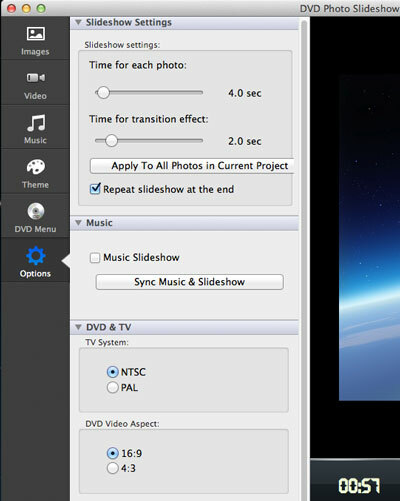 In iPhoto, click File -> Export -> Slideshow -> Export and then choose QuickTime Movie as the output video format. 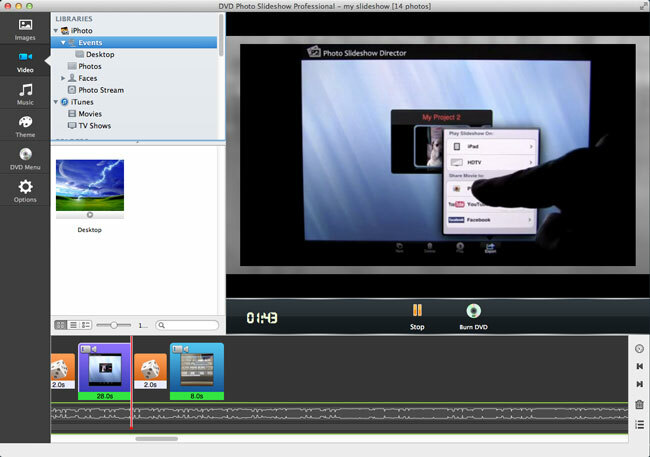 Then specify a folder to save the video and click the Save button to export the slideshow to an MOV movie file. In the Video tab, you will be able to browse the video files in your Mac. You can locate the video file generated with iPhoto and get it added to the project. 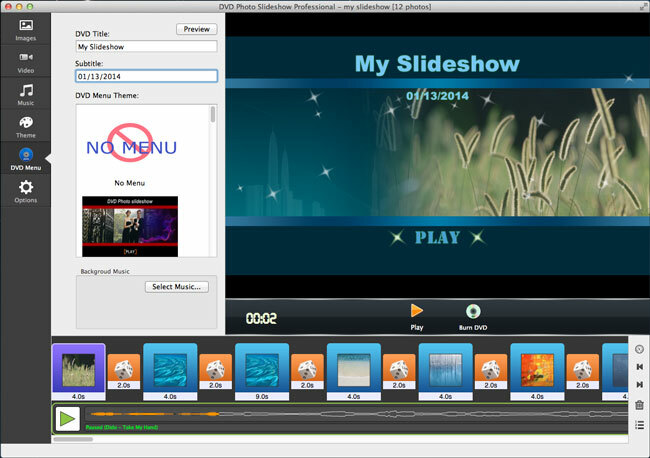 You can also click menu Slideshow -> Add Video Clip to add video files. Alternatively, you can directly drag and drop the video file from your Mac folder to the timeline. Go to the DVD Menu tab, and you can set DVD title and subtitle, pick a DVD menu theme, and select menu background music for the iPhoto slideshow DVD. To burn iPhoto slideshow to DVD, click menu Share and choose Burn DVD or click the Burn DVD button in the preview window. You can make some burning settings in the Burn Disc window. Click the Burn button to start burning iPhoto slideshow to DVD.